Just Howard (inside) held off Bonus Points to win the Caveat Stakes. Photo by Laurie Asseo. Just Howard faces another tough test Saturday, Sept. 30, when he carries his three-race winning streak into the $150,000 Commonwealth Derby (G3) at Laurel Park. The Commonwealth Derby for 3-year-olds is run at 1 1/8 miles on Laurel’s famous turf course. It is one of the featured races on the “Class on the Grass” program that has eight turf stakes, three of them graded. It formerly was contested as the Virginia Derby and run at Colonial Downs in New Kent County, Virginia. The Derby has drawn a field of eight that includes Voodoo Song, winner of the Saranac Stakes (G3) at Saratoga Race Course; graded-stakes placed Master Plan, an $850,000 2-year-old purchase; Ontario-bred Final Copy, who was second by a nose in the Breeders’ Stakes, the third leg of the Canadian Triple Crown; and Stuart Janney III’s homebred Profiteer, who returned from a layoff to win at Saratoga on the Travers Day program, Aug. 26. Just Howard is a Maryland-bred with deep roots in the state. He is named after his breeder, the late Howard Bender, is owned by Skeedattle Associates, the long-standing partnership of three friends from Clarksville, Md. and is trained by Graham Motion, who is based at Fair Hill in Elkton, Md. Motion said that adding blinkers in May isn’t the only reason why Just Howard broke his maiden in his sixth try and then won two Laurel stakes. Just Howard, a son of English Channel, earned that elusive first victory against older horses on May 29 at Pimlico. 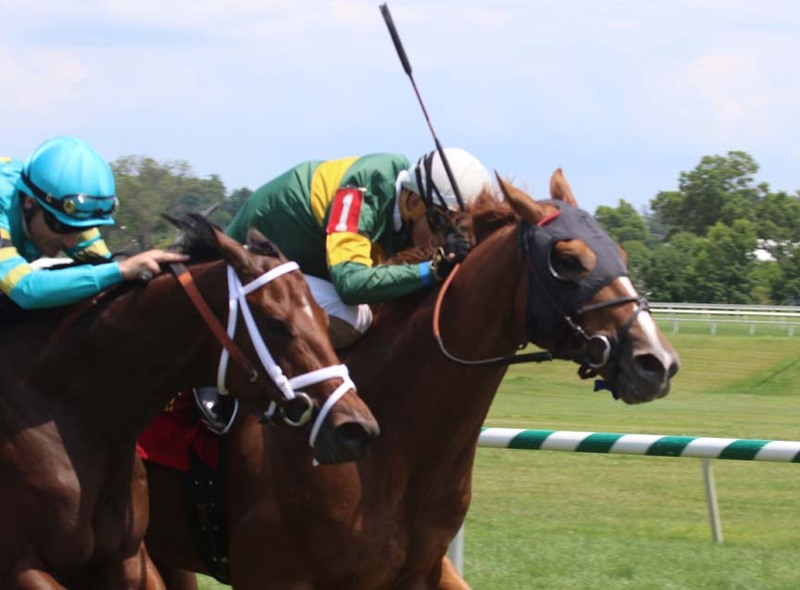 He beat 3-year-olds by a head in the Caveat at Laurel on July 15 and won the Find against older horses on Aug. 19 over soft ground. Motion said he normally wouldn’t start a 3-year-old against older horses in a stake, but he wanted to keep things simple with a start close to home. Though he was rank early, as he had been in the Caveat, Just Howard was all business at the end and got up to win by a neck. Robert ‘Willie” White, Lou Rehak and Bob Orndorff comprise Skeedattle Associates. Their first horse was Seattle Skeedattle. White, president of the Maryland Horse Breeders’ Association, and Rehak are business partners in Overhead Door of Washington D.C., and White and Orndorff have been friends since they were kids. Skeedattle purchased Just Howard for $37,000 in as a yearling in 2015, a couple of weeks before Bender died at the age of 84. Bender and his late wife Sondra, were stalwarts of the Maryland breeding and racing industry from the early 1980s. He was a principal in his family’s Blake Construction company. Skeedattle has had a number of graded stakes winners through the years, including Gin Talking, Dixie Talking and Done Talking. Their Mr. O’Brien won the 2004 Dixie (G2) and the the Kelso (G2) while earning $724,290. Just Howard is the first horse Skeedattle has given to Motion to develop. Just Howard drew post three and will be ridden by Feargal Lynch for the first time. Alex Cintron, who was up for the three straight wins, has a riding commitment at Delaware Park. Janney is seeking his second victory in the race. He won with Air Support in 2011 when the race was contested at Colonial Downs as the Virginia Derby. Profiteer is a son of War Front out of the mare Hit It Rich, who won three graded stakes. “He was a good 2-year-old and we thought he was bred to be one of the top 3-year-olds,” Janney said. “He was second in Tampa (in the Columbia Stakes) and then went to Keeneland and he was one of the favorites (in the (G3) Transylvania). But he didn’t run that well, so we decided to give him some time. We let him grow up at Fair Hill. He came back and ran at Saratoga against older horses, a pretty tough bunch, and won. Hall of Fame jockey Edgar Prado will ride Profiteer, who drew post five. The field also includes stakes winner Dover Cliffs, trained by Christophe Clement for Robert Evans; English Channel winner Bronson, owned by Three Diamonds Farm; and Threeohtwocassie, a Pennsylvania-bred who has won three in a row for Black Cloud Stable.